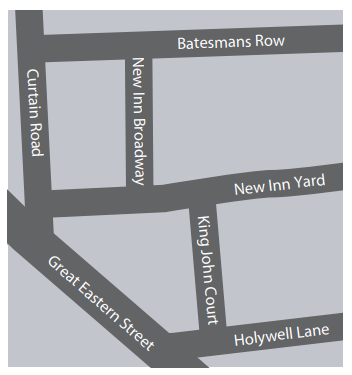 We are seeking your views on a proposed scheme to transform New Inn Broadway into a high quality street. We recognise the detrimental impact of air pollution in the City Fringe. Air pollution is responsible for the early death of approximately 10,000 Londoners each year and causes alarming rates of asthma and other respiratory illnesses in children. This has led to us creating a Low Emission Neighbourhood (LEN) in the City Fringe, made possible through funding partly from the Mayor’s Air Quality Fund. This scheme is part of a package of measures focussed on reducing emissions and promoting sustainable travel to improve local air quality. The approach we are taking includes a series of schemes intended to improve walking and cycling conditions within Shoreditch and Hoxton. Works to improve the environment for pedestrians have already been completed at Garden Walk and Bowling Green Walk, while works to enhance the public realm and make it easier, safer and more pleasant to walk and cycle are currently being implemented at Brunswick Place Gate and New Inn Yard. New Inn Broadway is one of the schemes that will contribute to making Shoreditch and Hoxton a more liveable and healthy place. Funding has become available through contributions from the new development at 4-6 New Inn Broadway to improve this location so that it’s safe, activated and has a strong identity. As a result of this funding we are proposing to completely transform this section of New Inn Broadway, creating a distinct and high quality street with trees, planting and seating. Bicycles and vehicles will still be allowed to use the street after the works are completed. We intend to enhance the public realm of New Inn Broadway by using a patterned paving design across both the road and pavement areas, with a traditional raised kerb arrangement. This should improve the way this space looks, making the public realm far more pedestrian friendly. We believe that making the environment more attractive encourages more walking and this scheme could play a part in achieving that. Given there is space for their root systems, the scheme will include some new trees that will contribute to a relaxing environment and a greener, friendlier character to the space. As part of the development on 4-6 New Inn Broadway, there is also a proposal to install a newly commissioned statue of Shakespeare on the corner of New Inn Broadway and New Inn Yard, which will give a nod to the location’s historic past as home to the playwright’s first theatre. We are also intending to install some seating opposite the new development, in addition to wayfinding signage and cycle stands. Creating a high quality space and planting trees and greenery will result in the loss of all car parking spaces in New Inn Broadway. For details of the proposal please download the drawing here. If the scheme goes ahead, following consultation, we expect construction works to start around August 2019 with completion in 20 weeks. Pedestrian access will be maintained at all times and businesses will continue to operate as normal. Further information regarding the works will be sent out close to the time. A. Yes. We will ensure that trees do not create dark spots by adjusting lighting levels if needed. Q. Is this a shared space scheme? A. No. A key feature of traditional road layouts is of using raised kerbs to delineate between road and pavement areas. This is incorporated into the design of this scheme. Q. Will deliveries to businesses or residential properties still be possible? A. The road will still function as it currently does in terms of vehicular access.